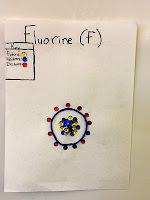 My students have been working hard completing their interactive Science notebooks for our chapter on Classifying Matter. 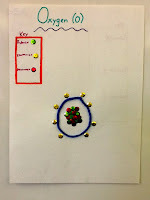 The first lesson in our Unit was on learning elements and atoms. 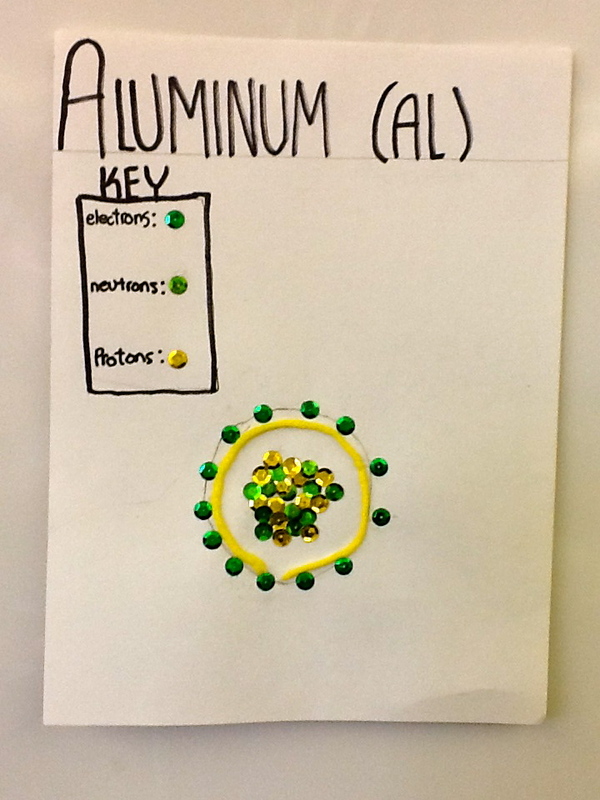 We read the lesson in the book and then I go over a PowerPoint I created on how to break down atoms and to know exactly how many protons, neutrons and electrons a particular element has. We talk about how each of these components have a different charge of positive, negative or neutral and some ways to remember which goes with each one. Students are always amazed that how just one proton makes the difference between whether you have Hydrogen or Helium and so forth. One of my favorite "quick" activities for this chapter is when I have my students build an element out of string and sequins. 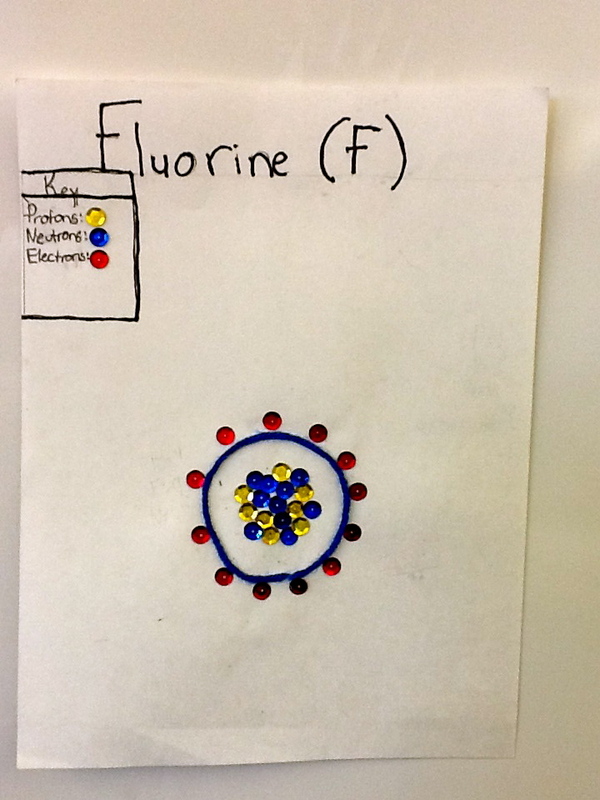 Before they can do this, they must figure out how many protons, neutrons and electrons the element has. Since they need to find matching sequins to represent each of these numbers, I typically only assign them elements 5-15 on the Periodic Table. 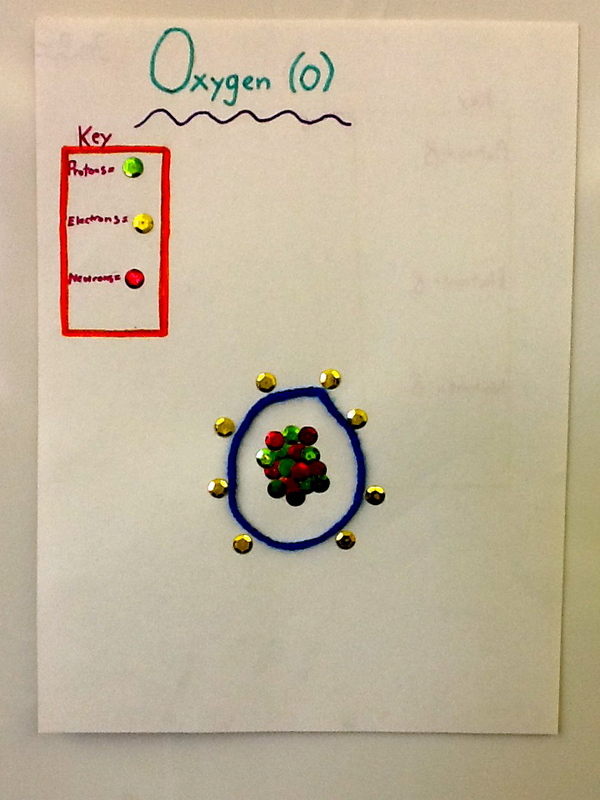 They can quickly determine the number of protons in the element by simply looking at the Atomic Number. And from there, they know that the number of protons is equal to electrons. However, in order to figure out the number of neutrons they need to use the formula we created of p+n=aw (p = protons, n = neutrons, and aw= atomic weight). This is fabulous because they have been learning all about different formulas in math class and how to isolate a variable to solve the equation. They need to show their work on the back of their project. Once they have figured out all the required data, they then cut a 8" string to form the barrier of the atom (in the future, I think I'll make it 10"). 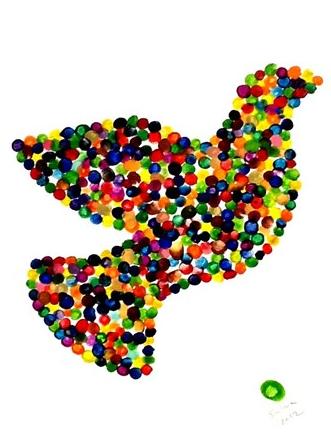 They then choose three different colored sequins to represet each of of the three different areas of the atom. They cluster together the protons and neutrons together in the center of the string which they know is called the nucleus. They then put the electrons on the outside of the string. 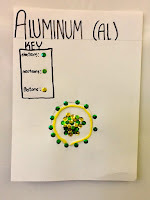 They need to create a key on their paper to tell the reader which sequin represents what and put the name of the element and its abbreviation on top. It's another Market Monday product review. This week we are focusing on Really Good Stuff's Store More Chair Pockets. Prior to having these chair pockets, I had handmade pockets that consisted of two hunter green table mats sewn together with think string coming from the sides to attach to the side of the desk or chairs. They weren't anything spectacular but the did the job.....kind of. 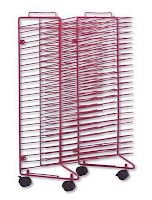 However, with the amount of books that our students have at our school and the fact that I make an organizational binder for each of my students (iPod Binders), I knew I had to get something that held more. So, this year I chalked up the money and got real chair pockets. I originally opted for the Store More Multi-Pocket Chair Cover with a spot for the water bottle. They were a bit more costlier but I did it while they were offering a 15% off special. I was so excited to get these pockets....but disappointment hit when they arrived. They didn't fit my students' chairs. They were way too small. So, I sent them back. To make matters worse, I had to pay return shipping which was close to $20. I wasn't happy about it but I still needed chair pockets. So I exchanged them out for the Store More Chair Pockets XL. My students have been using them for about 5 months. Here's the quick pro/con breakdown. Must purchase in sets of 6.....because we all have perfect multiples of six classes, right? When it comes to an overall rating for these chair pockets, I give them a 4. Mostly because of cost. I was lucky, I only had to buy three sets.....I can't imagine being able to purchase these if I had a typical class of 30+. 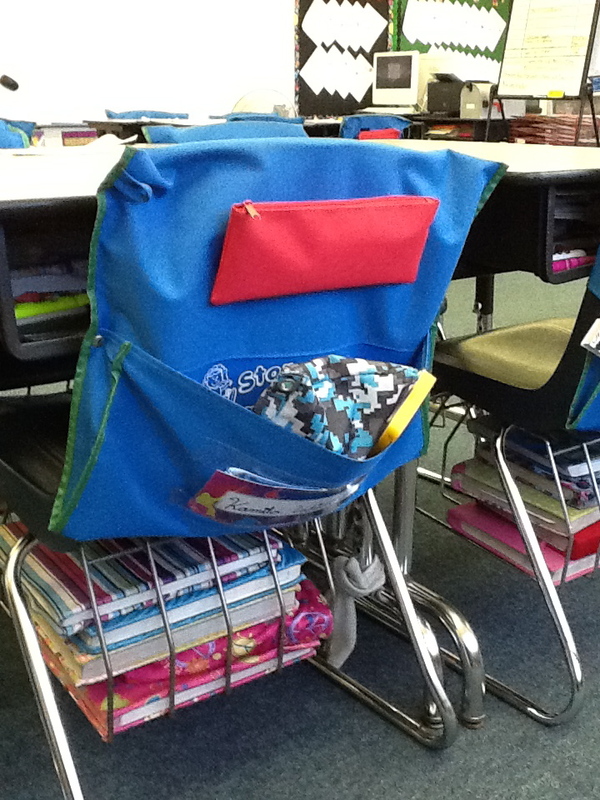 Do you have chair pockets for your classroom? What type and what do you think of them? Share down below in the comments section. Today is the first of many Website Wednesdays, in which I will introduce and discuss fantastic websites I use in my 5th grade classroom! 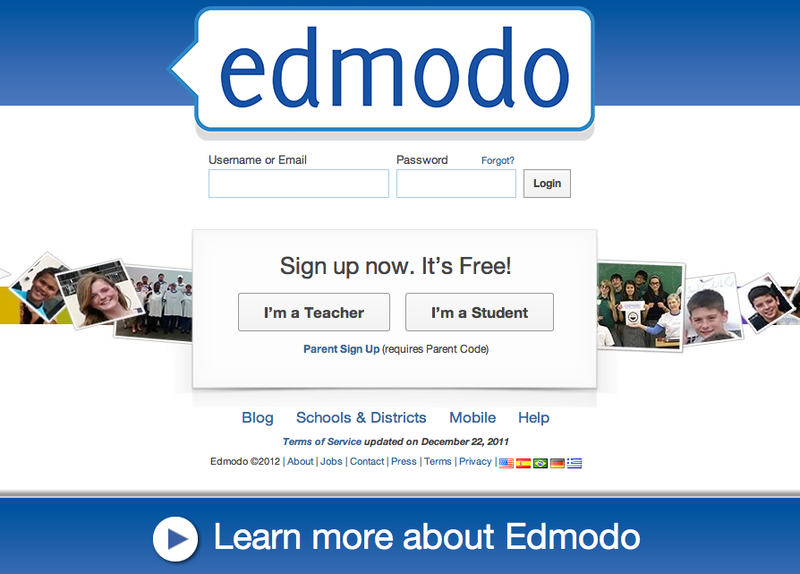 The website in which I want to talk about is Edmodo (www.edmodo.com). 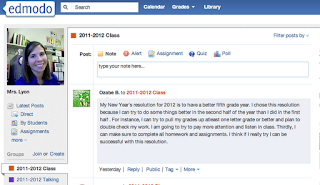 I'm a huge fan of Edmodo and have been using it with my students for the past two years. They have earned multiple awards, including the Award of Excellence in 2011 from Tech and Learning. However, I will admit that I have not probably utilized it to its fullest capabilities. 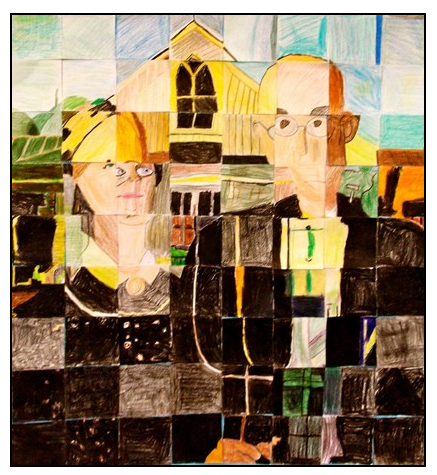 My goal is to continue to explore this website and improve my students' learning with it. "Edmodo provides a safe and easy way for your class to connect and collaborate, share content, and access homework, grades and school notices. Our goal is to help educators harness the power of social media to customize the classroom for each and every learner." 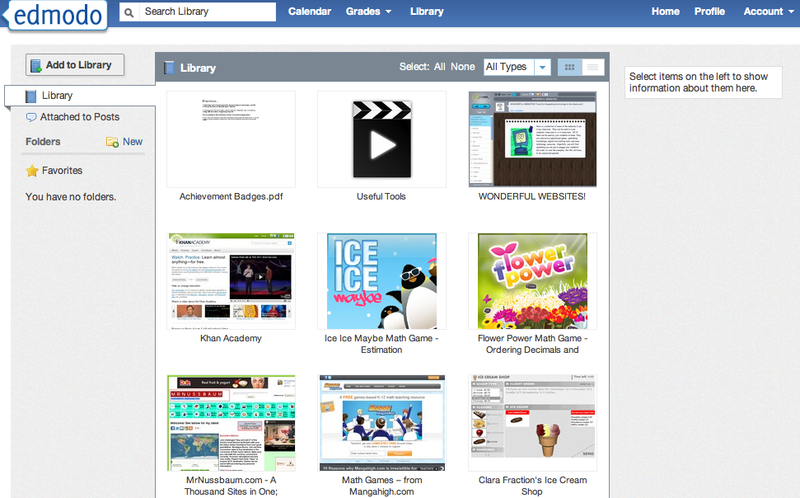 When you create an account with Edmodo, you have the ability to create as many classes as you want. So for example, I can (and in the past have) create different classes for Social Studies, Math, Science, Writing and so on. Or if you teach multiple groups, you can create classes and have only a select group of kids join. Seriously, the possibilities seem endless. Oh....and have I mentioned the best part yet???? IT'S FREE!!!!! My students and I both enjoy using this site. This year, I created just two classes. One for me to assign work, quizzes and polls and another class that we called "Talking" for the students to use to have their own discussions. Edmodo allows me to monitor their posts so I can be certain nothing inappropriate is going on. And because of its "Facebook" like look, students get really into it. They create profiles and upload avatars. And I don't have to worry about someone who doesn't belong being able to see my students. Let's review some 10 of Edmodo's capabilities. They have much more than 10, but we'll start there. # 5 - Built in quiz creator! 1. Able to create multiple classes for students with access codes. This way, only the people you want to be in the class can join with the code. 2. 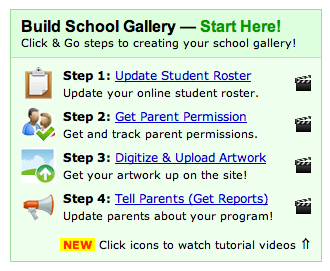 You can allow parents to login to the classes you create for students or you can even create one for just parents and communicate with them. 3. You can assign and collect assignments and provide due dates which show up on the built in calendar. 4. You can create polls! # 6. An example of my library. 5. You can create quizzes and tests that the students take right on Edmodo. 6. 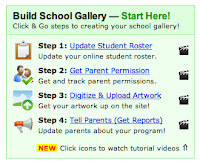 You can build a library of documents and websites and share them with students. 8. You can join communities with other educators. I enjoy visiting these and sharing ideas with other educators. Plus, I have found many great websites from this awesome community! 9. Edmodo hosts webinars all the time to help educators maximize this site. 10. They have a great app, so you can access this site even on the go. This helps a lot because my students use this website as a means to communicate with me. I have the ability to quickly respond back if needed. 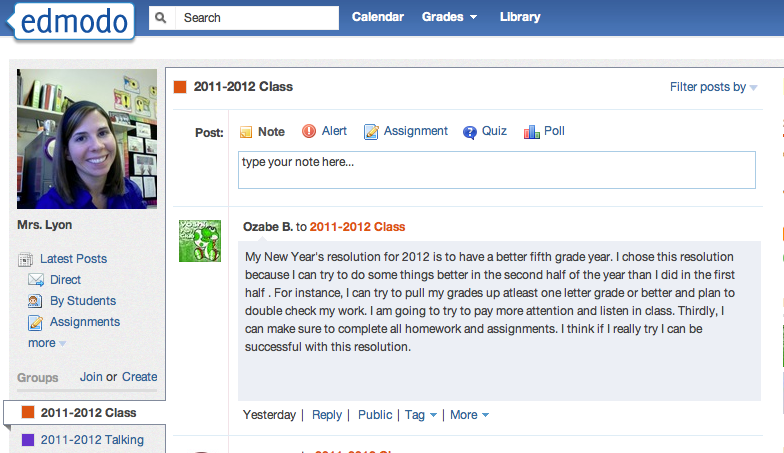 Again, Edmodo can do so much more....these are just the basics. If you haven't checked them out, I highly encourage you to do so. And, in my opinion it's not just for upper grades. I envision primary grades using this as a way to communicate with parents. Perhaps even more! 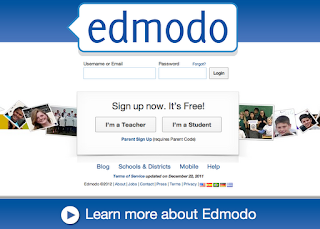 If you use Edmodo, what are some ways you utilize it? Share down below in the comments section. Here is the first feature of Market Mondays, in which I pick a product that I have used in my classroom and offer up a review. Today's product is geared toward any teacher that teaches art or uses paints or other things that need to be able to dry in their classroom. This year, I was determined to get a drying rack so I no longer had to have papers strategically placed throughout the classroom to dry after the students used either paint or something other medium that could possibly smudge. Plus, I can't stand having miscellaneous papers left on a student's desk unless it's being used. I like things to be very neat and organized, so when I got the Sax Stack-a-Rack Drying Rack for my classroom, I knew it would be perfect! 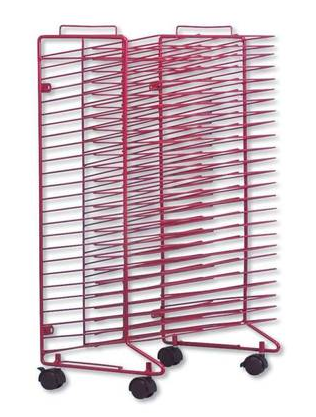 This awesome product can be found on Amazon or at the Learning Outlet for under $100. Only $85.49 on Learning Outlet and you get FREE SHIPPING! It came already assembled - all I had to do was throw the wheels on. The shelves do not lift up. Sometimes it is hard to see what shelf you are using and if there is a smaller piece of paper already there. It only comes in red. 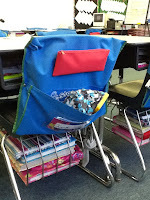 This worked for me since my classroom I use bold primary colors. However, there are a lot of teachers who use softer pastels. But upon further inspection, I believe you could easily spray paint this to match your color scheme. Despite those cons, I still award this product 4.5 out of 5 stars. It would have received 5 stars in the shelves were able to flip up. But hey - for $86 this is one awesome product!! 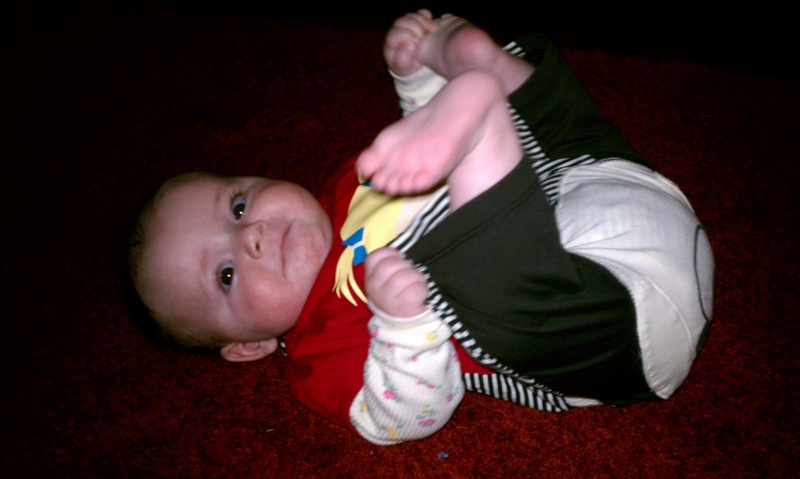 After taking some time since my beautiful baby, Kenzie, was born in July, I have finally decided to hop back into the world of blogging and sharing teaching ideas. 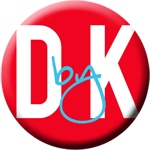 In order to keep this resolution of updating my site regularly, I have created a couple days a week in which I will have themes. This is what I have come up with (and feel free to give me more ideas in the comments below). Market Mondays: I will review and post my experience with products for teachers. Website Wednesdays: There are SO many great websites out there for me to share and discuss. That's it for now....as time goes on I may add more and of course I will post ideas or other things as they come up. In the meantime, I just wanted to take a moment to share with you my wikipage, which holds many resources that you just may find beneficial. Some of the popular items are located under the "Classroom Posters" tab. It is there that you can find posters that I have created for Genre, Literary Elements and Reading Strategies to name just a few. Why pay close to $20 on teacher websites when all you need to do is print and laminate? I hope you enjoy! All I ask for in payment is that you follow my blog and share it with a friend. AND - while you're there, be sure to join the wiki and Wiki With Us! Be sure to check back tomorrow, Market Monday, when I review an item that any teacher who teaches art should have!